One man's perspective of the Dallas women's march. This morning Jill and I march. No, we are not “whining” about an election. President Trump is our president. I don’t like it, detest it even, but I accept the reality of it, and even celebrate the peaceful transition of government. I march to make a public display about the rights of vulnerable people. These include women protected by the Violence Against Women Act, immigrant women held in detention, Muslim women, trans women, and all women whose rights HAVE been threatened already. Today this OLD WHITE CHRISTIAN man stands up. Hi, I’m Bill, and I’m an old white man. I don’t feel guilty about that. I worked very hard in my life to get where I am, but I am not blind to the privilege that permitted me to get here. I went to segregated private high schools and worked in jobs that no black man had ever held. My law school class had zero black students. It is no comment on my own achievement to acknowledge the advantages I received because of my race and gender. And these compel me to speak up for inequities that still exist. Also, I love the women in my life and want to support them. So I drove downtown and met with some friends as well as some of the women on my staff. I’m really fortunate to lead a staff of great women. One of our staff members took her two daughters to the march to add their voices. Our intrepid group parked off of Swiss and walked over to City Hall. Along the way, we started walking along with others. As we crossed Marilla, the crowd stretched as far as we could see. And that’s when I started running into people I knew. I saw local nonprofit leader Karen Blessen and her lovely husband Kelly Nash. We hugged and smiled. Then I saw my law school classmate and SMU professor and all-around badass woman Maureen Armour. My wife ran into someone she teaches school with, there with her parents. Then I ran into my long-time hiking buddy Scott Hudson and his beautiful wife Jimmie, a local artist. We walked with them for much of the march. Along the way, I saw publishing genius Will Evans and his beautiful wife. I ran into several people from my church, Greenland Hills United Methodist. One of them commented on how fortunate it was that this march was only planned in a week. There were very few manufactured signs. Estimates are that there were 8,000 to 10,000 people marching. It had a wonderful grass-roots feel to it. I found out about the march from a Facebook post. Most of the signage was handmade poster board, and there were some great ones. 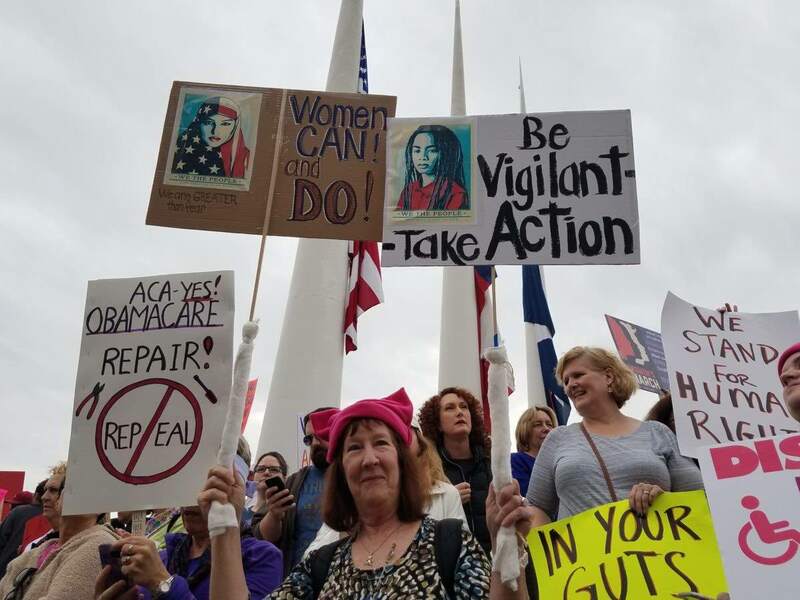 The signs addressed a wide array of issues: climate change, immigrant rights, reproductive rights, rights for LBGT people, civil rights, and voting rights. But mostly people walked and got to know their neighbors. One of the first people I saw was carrying a Venezuelan Flag. We currently have a lot of Venezuelan asylum seeker clients at Human Rights Initiative, and I was struck with the idea that it would be quite dangerous to attempt a march like this in Venezuela at the moment. I don’t take the right to peacefully protest for granted. I marched with a friend who came to the United States as an Ethiopian refugee. She said the last time she marched was in Ethiopia. That can get you shot. I have had many clients over the years jailed and tortured for what we did Saturday. So, for me, marching is a patriotic act and one with a lot of joy and gratitude for the rights enshrined in our constitution. It was a relatively diverse crowd. I marched alongside several African-Americans as well as Latin groups. There were tons of children and babies. I saw one older woman walking with an umbrella as a cane. I thought, I hope I’m doing this when I’m her age (which is looming).